Welcome to the 18th edition of the Pyro News. Once again life has been very busy for me and, consequently, it's been a long time between drinks for the Pyro News. Hopefully this bumper issue will make up for the lack of frequency. A Pyrographic Show, 'Twentieth Century Pyrography' - You're Invited! Regarding being notified about a release of a newsletter, I do this via email, so be sure to include pyro_news@iprimus.com.au in your 'safe senders' list on your email program so the notification won't be blocked by your spam filters. I hope you enjoy the read and the free video tutorials. PYROGRAPHY SHOW! Would you like to exhibit? Andrew's Art Museum - "Twentieth Century Pyrography"
Exciting news has come from respected pyrographic artist, Tom Vogler and the Andrews Art Museum. The museum has decided to run a 3 month pyrographic show, Twentieth Century Pyrography, starting in June, at it's beautiful museum situated in Andrews, North Carolina, USA. The museum is inviting pyrographic artists interested in exhibiting to fill out an application form and submit it by the 20th of March. I know it doesn't give us a lot of time but I'm pretty sure that sending an intention of exhibiting via email, then backing up by posting the application, should secure your spot. If in doubt or if you have any other questions, please contact Andrews via email. There is a handling fee of $100 USD per artist. The art work is intended for sale and the artists will get the entire sales amount if a piece is sold. They are intending to have live streaming video, receptions with music and food. the show will also be heavily advertised and a catalogue will be produced. It sounds like it's going to be something! Pre-embargo ivory piano keys can still be found floating around. These keys were manufactured before a ban was placed on the importation and trade of new elephant ivory. Keys made after this period are made of plastic or other synthetic materials and, because of health reason, they should not be burnt on. 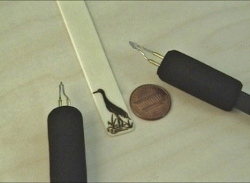 Even though ivory piano keys were made before trade bans were put in place, I believe it is still illegal to ship them to another country...so keep that in mind when making these for a gift or for yourself...keep it in country. Where can you get old piano keys? A few years back I was fortunate enough to be given a bucket full of old ivory keys by a piano restorer. Hit the yellow pages and ask around. You can also find old keys at some second hand/junk stores/flea markets/antique shops/Sunday markets, etc. And lastly, I found several listings of pre-embargo ivory piano key sales online...but they all sell within their own country, so keep this in mind. How can you tell ivory keys from synthetic? One of the ways you can tell is by burning a small dot. If it doesn't melt and it smells like burnt hair, this most likely is an ivory key. Keep in mind that burning on ivory isn't restricted to bookmarks alone. 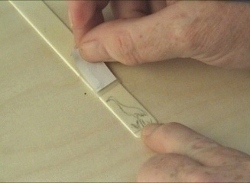 Old ivory can be very effective when used as an inlay in another project or for making jewellery. You can click the link above to view the video on YouTube or you can view it on the player below. 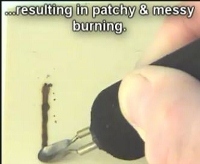 On the player you can also view 4 other free pyrography snippets that I have produced: Erasing Woodburning, Using the Spoon Shader, Burning a Gourd Quilt and The Tea Strainer Tip Cleaner. Step 1: Clean the key by buffing it with some fine grade steel wool. Step 3: ...or by a power tool. 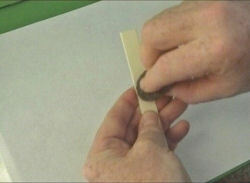 Step 4: Use a sanding pad or paper to round the corners if you wish. Step 5: Sometimes the reverse side of the key has ridges cut into it. 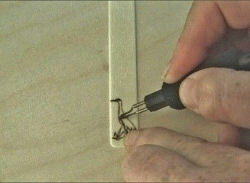 (This helped the glue adhere the key to the original wooden surface below.) You can elect to sand this off if the key is wide enough to allow it. Step 6: Resize the pattern to allow it to fit the bookmark. 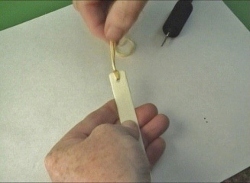 Use some tape to hold it in the desired position on the key. Step 8:...and trace with a hard lead pencil. Step 10: Outline the project with a fine skew. I love the Razertip F14S for miniature work like this. (Other brands of burners will most likely have a similar type of nib.) What is is like to burn on ivory? Well, for a start you need an extremely HOT nib to make an impression. You'll also notice that it's a STICKY burn. when outlining you will feel the skew grab, making fluid motion very difficult. (You'll see this in the video.) 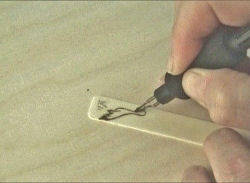 Keep your hand pressure as light as possible, have your nib clean and sharp. Go back over your outline to neaten it and fill in any missing gaps. 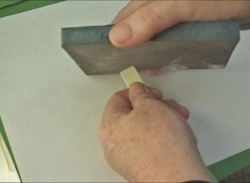 Press the skew in rather than dragging it if you have too much difficulty. Step 11: Oops! 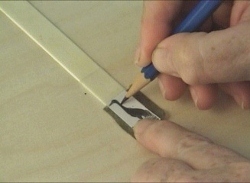 Draw back in the reeds or any other missing pattern with an HB or 2B pencil. Step 12: Once the outline has been burnt by the skew you can now fill it in. As I've said, smooth movement over the surface is quite difficult so I opted to stipple in the centre filling. 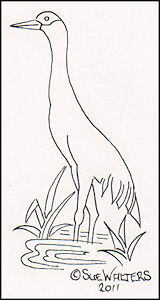 The toe of the skew can be used to this...simply turn it over and use the point to stipple small adjacent dots. Step 13: Another option for stippling the fill is to use a fine ball tip or a fine writing tip. (I found this faster, neater and easier.) In this case I'm using a Razertip F99.008 (.8mm) ball tip. (Once again, a very fine writing tip should be found in many other brands.) Remember, ivory absorbs an enormous amount of heat during a burn so it's a good idea to let it cool down every few minutes. Burning for long periods of time can make the key extremely hot to hold and it can also fracture the material. 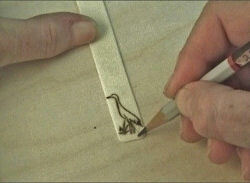 Step 14: Once the reeds and crane were filled in I used the miniature ball nib to burn the water and to sign my name. I then used a slightly damp tissue to clean up any excess soot and carbon. Step 15: Seeing the surface of the key is so shiny, I was worried a drill bit would slip without some kind of guide mark. I used a ball writer to burn a slight depression before drilling the cord hole. Step 16: A drill press would obviously be perfect to drill the hole but I don't have such luxuries. Instead I used a drill bit in a dremel rotary tool. I had the speed quite fast and made sure I pressed down firmly with my fingers to secure the key from slipping. 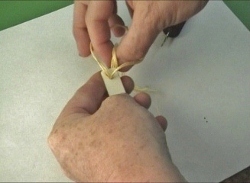 Step 17: Take some decorative thread or cord and fold it in half. 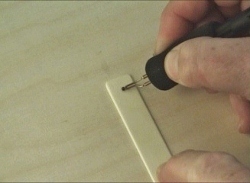 Push the folded part of the cord through the back, towards the front. Only pull it part way through, making a loop. Then take the loose cord at the back, pass it over the top and through the loop. 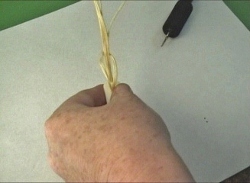 Step 18: Gently pull on the loose thread until the noose starts tightening. 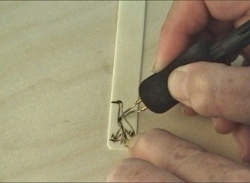 Step 19: Pull until the noose is neat and tidy against the key. Trim the ends, polish the key with a soft cloth and you're done. 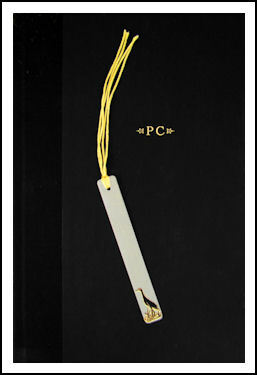 There's no need to seal or varnish the bookmark. 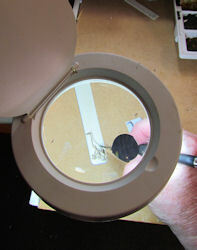 21: A craft magnifier might be a help to you when burning miniatures. This one has it's own built in light. 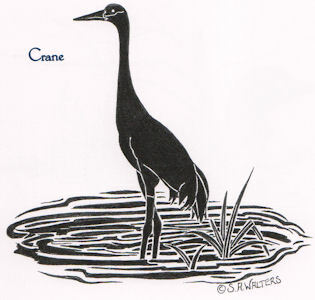 22: A closeup of the little crane. 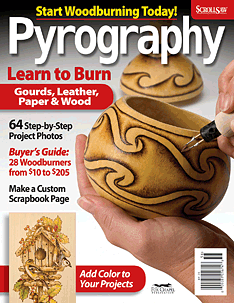 Fox Chapel Publishing has issued a pyrography magazine! Fox Chapel have produced the 'Pyrography Magazine...a thick, glossy read that is jam packed with articles, step-by-step projects and all things pyrography. The cost is $9.95 USD. 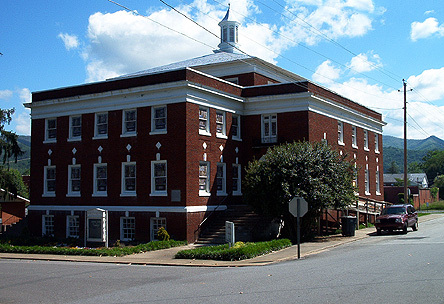 People interested can visit Fox Chapel for more information. I understand that, if the feedback and sales from this issue are good, we could see further issues in the future. Updating my Links Page...Let's Swap. It doesn't matter if it's a small site or a large. 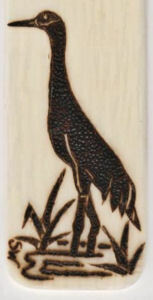 All sites will be included as long as it's pyrography related in some way and had a links section. It's equally important that you don't clean your tips using an abrasive method. 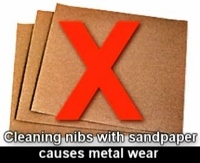 Scraping tips on sandpaper will cause the metal to gradually wear away. Because of this it's better to clean your tips on something non abrasive. That's where the tea strainer comes in. I was doing some particularly heavy stippling with a spoon shader last year and was getting quite sick of constantly kicking the muck off my shader by rubbing it against some old paper. Bits of carbon and grime were getting everywhere! I decided to get an old tea strainer from the kitchen to use the fine metal mesh to scrape off the shader. It worked far better than I thought and, since then, I use the Tea Strainer Cleaner when burning with a shader, medium to large balls and on medium to large skews. It's particularly useful when doing heavy texture work, which can quickly build up a heavy layer of crust on the burning tip. You can click the link above to view the video on YouTube or you can view it on the player below. 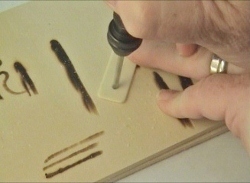 On the player you can also view 4 other free pyrography snippets that I have produced: Erasing Woodburning, Using the Spoon Shader, Burning a Gourd Quilt and the Ivory Bookmark. 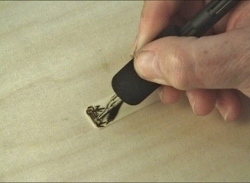 1: When a pyrography tip gets encrusted with carbon and other residue it prevents the tip from smoothly sliding across the surface. Seeing that consistent tip speed is a key to neat burning, this drag can be one of the major causes for sloppy burning. Remember: A clean tip = consistent nib speed. Consistent nib speed = neat burning. 2: A clean nib will slide more smoothly across your burning surface. Think of a clothes iron. If the base of your clothes iron is dirty it will prevent the base from slipping smoothly across the cloth...instead it will grab and stall in it's movement. 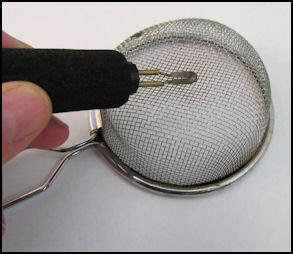 4: The mesh of a fine metal tea strainer makes an excellent tip cleaner. The fine mesh dislodges the grime, which falls to the surface below. I've depressed the bottom of my cleaner slightly to accommodate the curve of a spoon shader and writing tip. 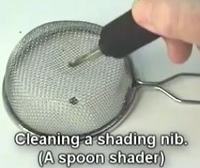 5: The tea strainer cleaner is especially good for cleaning shaders and medium/large writing tips. 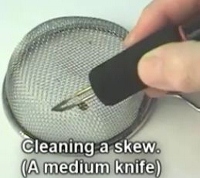 6: The edge of a skew can be scraped against the sides of the strainer to clean the blade. 7: Medium to large ball and writing tips can also be cleaned. If the tip is too small it will fall between the mesh and get caught. 9: ...and placing some metal mesh over the top. Aluminium, (aluminum) flywire would be good. 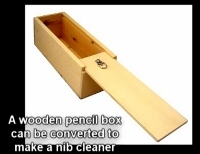 10: A cheap wooden pencil box would be a good option. The type with a sliding lid would be ideal. The box can be turned over, it's bottom removed and replaced by mesh. The sliding lid, (that is now the base of the cleaner), can be opened now and then to remove the collected carbon and grime. I'm often asked to do commission work or, if I can't do it, do I know someone who can? We need a place where pyrography artists can advertise their willingness to take commission work...a place where prospective clients can come and find the artist that best suits their needs, both in burning style and location. I see this place as a data base containing the following information: 1) Name of business/person 2) Location 3) Website, email or other contact information 4) Your pyrographic speciality, IE: pet portraits, gourds, colour, monochrome etc. 5) A little blurb about yourself. IE: what you like to burn or happy to take on, location willing to ship to/cater to. 6) A picture of your best work or the work that best represents what you are trying to sell. This will be an absolutely free service. It's simply a bulletin board for pyrographic artists to advertise themselves...and a way for me to find prospective clients the artist they need, without being too involved. I can simply point the client to the data base and they can choose for themselves. If you are interested in being listed in the PYROGRAPHIC ARTIST REGISTRY then please fill in the form below or Email Sue.